Sunni and Shia Muslims share the most fundamental Islamic beliefs and articles of faith and are the two main sub-groups in Islam. They do differ, however, and that separation stemmed initially, not from spiritual distinctions, but political ones. Over the centuries, these political differences have spawned a number of varying practices and positions which have come to carry spiritual significance. The Five Pillars of Islam refer to religious duties to God, to personal spiritual growth, to caring for the less fortunate, self-discipline, and sacrifice. They provide a structure or framework for a Muslim's life, just as pillars do for buildings. Sunnism is the largest and most orthodox branch of Islam. The word Sunn, in Arabic, comes from a word meaning "one who follows the traditions of the Prophet." 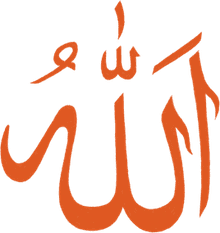 Sunni Muslims agree with many of the Prophet's companions at the time of his death: that the new leader should be elected from among those capable of the job. For example, following Prophet Muhammad's death, his close friend and adviser, Abu Bakr, became the first Caliph (successor or deputy of the Prophet) of the Islamic nation. On the other hand, some Muslims believe that leadership should have stayed within the Prophet's family, among those specifically appointed by him, or among Imams appointed by God Himself. Shia Muslims believe that following the Prophet Muhammad's death, leadership should have passed directly to his cousin and son-in-law, Ali bin Abu Talib. Throughout history, Shia Muslims have not recognized the authority of elected Muslim leaders, choosing instead to follow a line of Imams which they believe have been appointed by the Prophet Muhammad or God Himself. The word Shia in Arabic means a group or supportive party of people. The commonly-known term is shortened from the historical Shia't-Ali, or "the Party of Ali." This group is also known as Shiites or followers of Ahl al-Bayt or "People of the Household" (of the Prophet). Within the Sunni and Shia branches, you can also find a number of sects. For example, in Saudi Arabia, Sunni Wahhabism is a prevalent and puritanical faction. Similarly, in Shiitism, the Druze are a somewhat eclectic sect residing in Lebanon, Syria, and Israel. Where Do Sunni and Shia Muslims Live? Sunni Muslims make up an 85 percent majority of Muslims all over the world. Countries like Saudi Arabia, Egypt, Yemen, Pakistan, Indonesia, Turkey, Algeria, Morocco, and Tunisia are predominantly Sunni. Significant populations of Shia Muslims can be found in Iran and Iraq. Large Shiite minority communities are also in Yemen, Bahrain, Syria, and Lebanon. It is in areas of the world, where Sunni and Shiite populations are in close proximity, that conflict can arise. Coexistence in Iraq and Lebanon, for example, is often difficult. The religious differences are so embedded in the culture that intolerance often leads to violence. Stemming from the initial question of political leadership, some aspects of spiritual life now differ between the two Muslim groups. This includes rituals of prayer and marriage. In this sense, many people compare the two groups with Catholics and Protestants. Fundamentally, they share some common beliefs but practice in different manners. 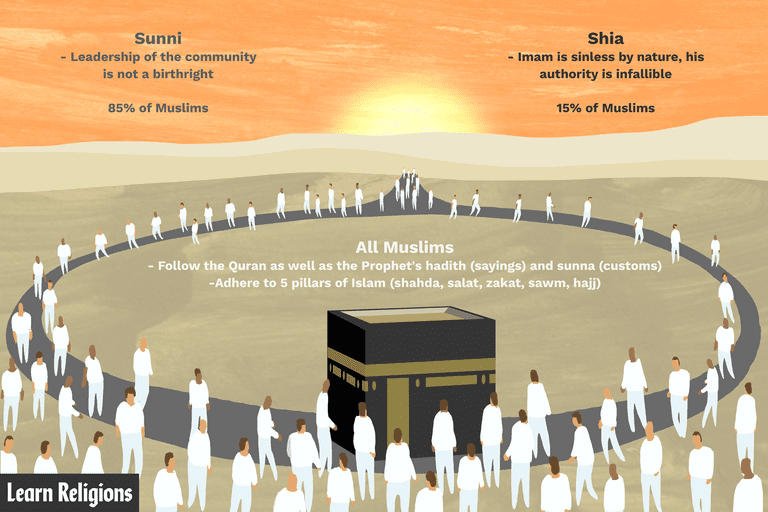 It is important to remember that despite these differences in opinion and practice, Shia and Sunni Muslims share the main articles of Islamic belief and are considered by most to be brethren in faith. In fact, most Muslims do not distinguish themselves by claiming membership in any particular group, but prefer, simply, to call themselves "Muslims." Shia Muslims believe that the Imam is sinless by nature and that his authority is infallible because it comes directly from God. Therefore, Shia Muslims often venerate the Imams as saints. They perform pilgrimages to their tombs and shrines in the hopes of divine intercession. This well-defined clerical hierarchy can play a role in governmental matters as well. Iran is a good example in which the Imam, and not the state, is the ultimate authority. Sunni Muslims counter that there is no basis in Islam for a hereditary privileged class of spiritual leaders, and certainly no basis for the veneration or intercession of saints. They contend that leadership of the community is not a birthright, but rather a trust that is earned and may be given or taken away by the people. Sunni and Shia Muslims follow the Quran as well as the Prophet's hadith (sayings) and sunna (customs). These are fundamental practices in the Islamic faith. They also adhere to ​the five pillars of Islam: shahada, salat, zakat, sawm, and hajj. Shia Muslims tend to feel animosity towards some of the companions of the Prophet Muhammad. This is based on their positions and actions during the early years of discord about leadership in the community. Many of these companions (Abu Bakr, Umar ibn Al Khattab, Aisha, etc.) have narrated traditions about the Prophet's life and spiritual practice. Shia Muslims reject these traditions and do not base any of their religious practices on the testimony of these individuals. This naturally gives rise to some differences in religious practice between the two groups. These differences touch all detailed aspects of religious life: prayer, fasting, pilgrimage, and more.